In 1944 the United States Congress introduced the bill that paved the way for the Veterans Administration (also called VA) to officially offer the VA mortgage to veterans. While there have been a few changes and improvements to the lending rules over time, the main intent remains the same; to offer housing to qualified veterans at affordable prices. The VA does not lend out money for mortgages. Instead, it has a list of guidelines that must be used by lenders. Once a lender is approved by the VA the lender is then legally able to offer the mortgages to its clients. The biggest advantage that a VA mortgage has over most other mortgages is the no down payment option. When the VA mortgage was first offered, it was a common practice for people to wait for 5 to 10 years before buying a home. This waiting period was necessary to save up the 20% down payment requirement that was quite prevalent at the time. As long as the veteran is eligible for the VA loan and they have their eligibility certificate they will not be required to make a down payment on the home. The VA Mortgage allows for no down payment options for home purchase. In order to be eligible for the VA mortgage, a person must fall into one of the following categories. 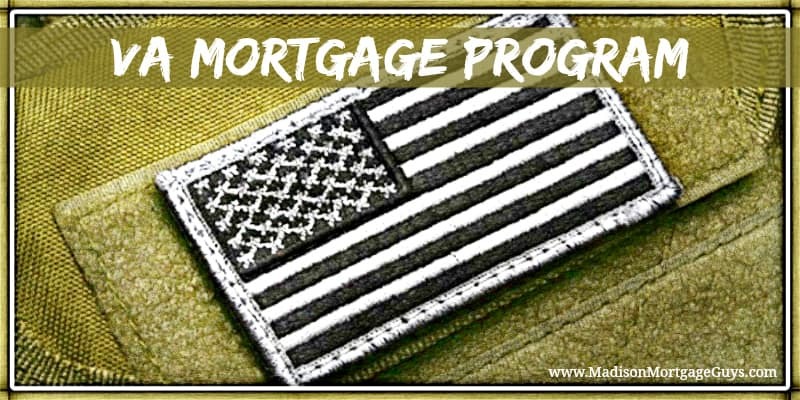 For veterans that served in the military full time, they must have completed a minimum number of days of service in order to be eligible for the mortgage. The minimum day’s requirement will be based on when they served. For example, veterans that served during the Vietnam War must have served at least 90 days of duty. On the other hand, veterans who served between 1990 and the present year must complete at least 24 months of service. For people who are currently serving in the military full time, they can be eligible for a mortgage after finishing 90 days of service. A select group of other people is also eligible for the VA mortgage loan. This group includes the surviving spouses of veterans as well as the children of veterans. Another major benefit of the VA mortgage over other loans is the lack of mortgage insurance. Most home loans will require a monthly mortgage insurance premium if the borrower receives a loan that is higher than 80% of the home’s value. This insurance is designed to protect the lender in the event that the homeowner stops making payments on the mortgage. For many borrowers, the mortgage insurance premium can range from as little as $60 per month all the way to $235 per month. Since the VA does not require this premium the veteran can qualify for a slightly higher loan amount than they would with other types of loans. The Veteran’s Administration charges a fee on each mortgage. This fee is commonly called a funding fee. The money collected from the fee is used to manage the mortgage program for the Veteran’s Administration. Veterans who would be entitled to receive compensation for service-connected disabilities if they did not receive retirement pay or active service pay. Veterans who are rated by VA as eligible to receive compensation because of pre-discharge disability examination and rating. If you think you are exempt or you are not sure, let us know and we can fax VA Form 26-8937 to the VA for confirmation. The turnaround time is usually 24-48 hours before we would know for sure. It would seem that with the no down payment feature of the VA mortgage, many veterans would feel that it is easy to simply walk away from the loan if times get hard. However, the residual income and debt ratio rules used by the VA underwriters have proven that this loan model can work. To date, VA mortgages have the lowest rate of default among all mortgage types. The debt to income ratio test states that the borrower’s total debt payments plus the proposed mortgage payments cannot be higher than 41% of the person’s monthly gross income. The VA guidelines use only this one ratio instead of multiple ratios like other mortgage loans. The residual income guidelines dictate how much money the borrower should have left after they have made all of their debt payments. This residual, or discretionary income, allows the borrower to have enough funds to take care of other necessities such as clothing, food, transportation, and utilities. In order to be fair to the borrowers, the residual income requirements vary based on two factors; the size of the family and the location of the home. It is possible for borrowers with a debt to income ratio above 41% to get approved. In order to do so, their residual income would need to be at least 20% higher than the recommended guidelines. VA mortgage only uses one debt to income ratio for qualifying a borrower. View Residual Income tables below. It is possible to borrow a small, extra amount to be used for making minor repairs to the home or to improve the home’s energy efficiency. Rental properties are not eligible for VA mortgage financing. The VA loan offers financing for a wide range of properties including single family homes, condos, 2-4 unit owner-occupied homes and new construction homes. The VA mortgage guidelines allow many borrowers with less than perfect credit to get approved for a home loan. Heavy emphasis is placed on the history covering the most recent 12 months. As long as debt payments for the past year have been made on time, the veteran has a very good chance of getting approved for a loan. The Certificate of Eligibility is a form from the federal government that indicates the veteran has met the service requirements for the VA mortgage. There are two ways a person can get a Certificate of Eligibility (also called COE). The simplest way to get the COE is to contact a loan officer that is experienced with VA mortgages and ask them to get the COE. Approved lenders can access a specific website and print out the COE for the veteran. This process can be done within a few minutes. The other way to get a COE is to complete form 26-1880. This form must be filled out and then the lender can submit the form via the aforementioned website. The form is rather short, asking for basic information such as name, date of birth, home address and phone number. Along with the 26-1880, the veteran will also have to present one of the following items: DD-214 or their Statement of Service. The DD-214 is a form for veterans who have been discharged from active duty. The person’s years of service along with details of their separation are included on the form. Veterans that do not have a copy of their DD-214 can request one from National Personnel Records Center. For people that are still serving as active duty personnel, a Statement of Service will be used in place of the DD-214. This statement should indicate when the person’s active duty began and needs to be signed by either a senior commanding officer or the assistant to the officer. VA mortgages are offered with either fixed rates or adjustable rates. The fixed rate loans can be financed over 10 years, 15 years, 20 years or 30 years. The adjustable-rate loans typically offer a period where the interest rate is fixed for a certain amount of time and then the rate will adjust once a year afterward. The fixed period can range from one year to 5 years. In addition to the flexibility of choosing different loan terms, the VA mortgage does not charge a prepayment penalty if the borrower chooses to pay off the loan early. Paying off the loan early can be done by either adding extra money to each monthly payment during the year, paying a lump sum amount once a year or simply paying off the balance entirely ahead of the calculated due date. Illinois, Wisconsin, Minnesota and Florida VA mortgage loans are capped at the conforming loan limit of $484,350 for a no money down loan. For loans over $484,350, please see our Jumbo VA Loan page. The Second Tier Entitlement on VA mortgages is a lesser known product but it can be a huge benefit for a qualifying veteran. The second tier allows a person to get a 2nd VA loan under specific circumstances or they can pursue the purchase of a home after defaulting on a prior mortgage. To be fair, there is a bit of scrutiny applied to the underwriting process. For qualifying veterans that are attempting to get a 2nd VA loan, the normal debt to income ratios will still apply and the lender will go by the letter of the law to determine the veteran’s monthly income. Furthermore, the veteran will have to provide a specific, reasonable need for the 2nd loan. Most of the time the people that get approved have received their PCS order and want to keep their current home as a rental. For those veterans that may have suffered through a financial hardship, the Second Tier Entitlement on VA mortgages is a great way to regain homeowner status. Once again, the underwriter will examine the application with a bit of scrutiny to determine that the veteran has recovered from the previous financial hardship. However, as long as the veteran has improved their overall credit and demonstrated the ability to make the potential mortgage payment, they should be a candidate for the VA second tier Entitlement. With the guarantee of the federal government and the appeal of no down payment with no PMI, the Second Tier Entitlement on VA mortgage is a great way to help many veterans purchase a home. The entire process of buying a home using a VA mortgage can be summed up in a few steps. Along with the other benefits offered by the VA loan program, there is also the ease of refinancing if rates drop. The official name of the program is called the Interest Rate Reduction Refinance Loan or IRRRL for short. It is also referred to as a VA streamline refinance. The goal of the loan is to allow veterans to refinance their home at a lower rate. The loan does not allow for cash out transaction. No cash out is allowed for the transaction. For this program, the borrower does not have to undergo a credit check. Neither is there any request to prove income. An appraisal is not required either. In order for the loan to be approved, the new mortgage payment has to be lower than the current mortgage payment. The only exception is if the homeowner is refinancing from an adjustable rate loan to a fixed rate loan. over 5 Add $75 for each additional member up to a family of 7.
over 5 Add $80 for each additional member up to a family of 7.